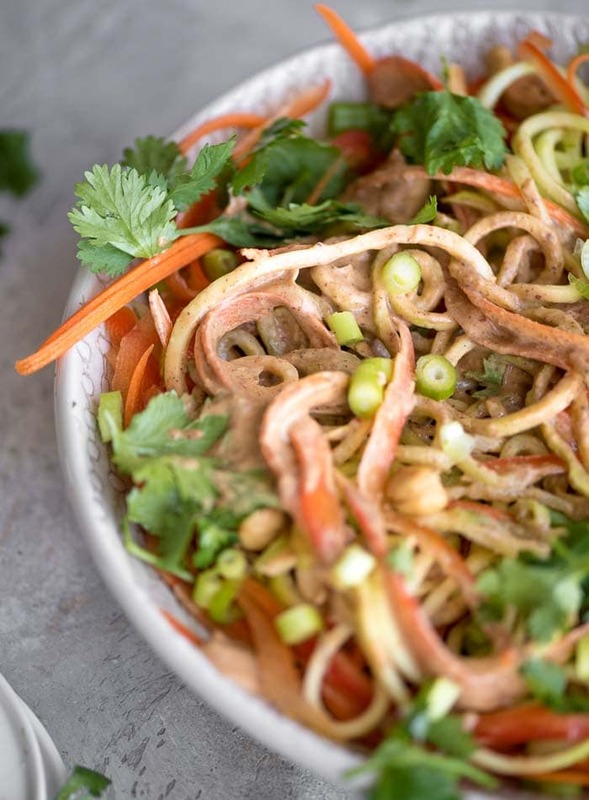 This vegan Pad Thai Vegetable Noodle Salad is made with a mixture of zucchini and cucumber noodles with bell peppers, carrot, green onion, cilantro and cashews to create a Pad Thai feel. 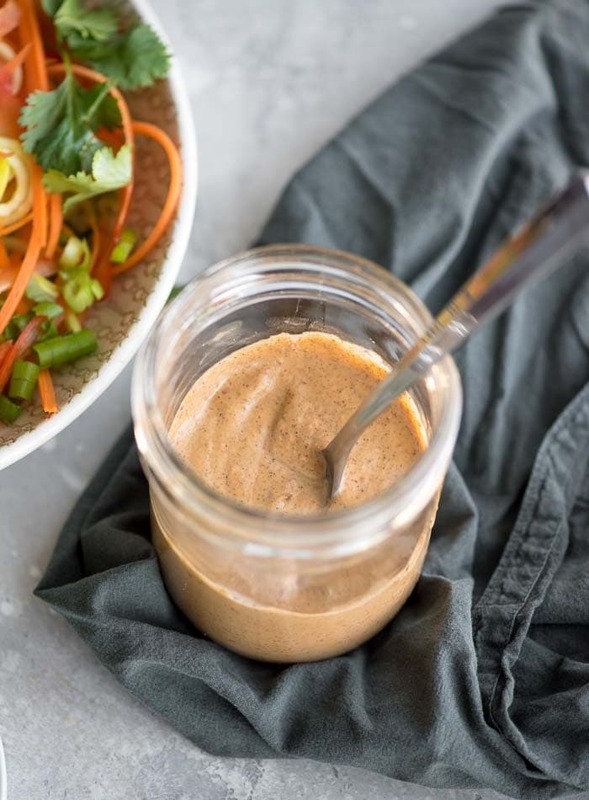 The creamy vegan Pad Thai sauce is made from a base of almond butter and tamarind paste. This recipe is vegan, oil-free and gluten-free. I made the vegan pad Thai sauce for this recipe from almond butter, tamarind paste, tomato sauce, garlic, salt, coriander, raw stevia, soy sauce and red pepper flakes. It’s the perfect balance of sweet, tangy and spicy! It takes just a minute to whip it up and it can be used over any kind of noodles, stir-fries, salads or buddha bowls. You can use peanut butter as an alternative to almond butter in this recipe but I love it with the almond butter. You can also use almonds instead of almond butter but I’m not sure the exact amount you’ll need. I would try 1/4-1/3 cup to start then slowly add a few more as needed. It would be awesome as an alternative sauce on my Coconut Cauliflower Rice Buddha Bowl or Broccoli Brown Rice Bowl. I’ve been loving having this dip on hand in the fridge. I like thinning it out a bit and using it for salad dressing but it’s also awesome over tofu, rice and veggies or on the cold veggie noodle salad recipe I provided below. If you’re not familiar with tamarind paste there’s not much to it but it’s a key ingredient in this sauce. It’s made from the tamarind fruit and is mostly used in Asian and Middle Eastern dishes. It’s flavour is a little sweet, a little sour and a little tangy and I use it often for Asian-inspired sauces and stir-fries. It’s fairy easy to find too, look in the Asian Foods section of your grocery store or find it an Asian or Middle Eastern specialty store. If you can’t find it in stores, you can buy it online here. I wasn’t totally sure where to go with vegetable portion of this dish, it’s really more about the sauce than anything but I did provide a recipe for a raw zucchini and cucumber noodle salad with scallions, bell peppers, carrot, cilantro, lime and cashews. This dish can be served hot or cold, both are great! I’d recommend spending some time on the chopping so you have julienned, noodle-like carrots and peppers. I use a julienne peeler like this one. It takes just a few minutes to create noodle-y carrots and use can you it for the cucumber and zucchini too if you don’t have a spiralizer. To serve this dish hot, add the peppers, carrots and scallions to a pan and give them a quick stir-fry, then mix in the cashews, zucchini noodles, cooking for just a couple of minutes. Served topped with the sauce, fresh lime and chopped cilantro. You can also just add everything to the pan and serve it all mixed up. 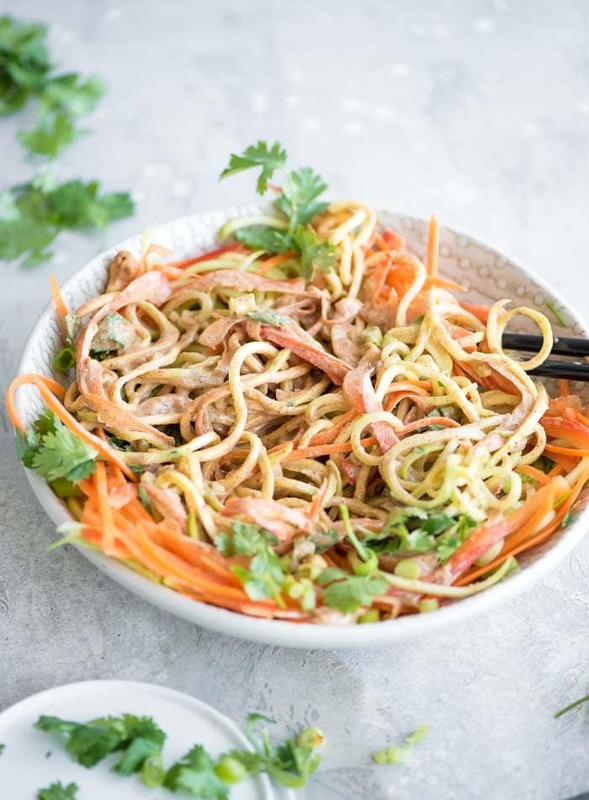 If you want to go with a cold noodle salad for a light Summer dish, just add everything to a big bowl, mix, serve and enjoy. This recipe is more about the almond pad Thai sauce than the noodle salad. 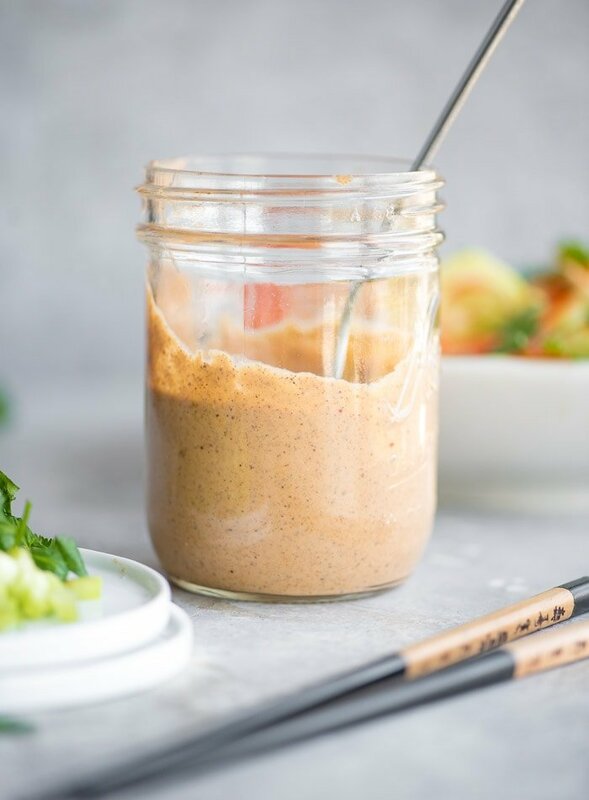 Enjoy this sauce with pasta, rice noodles, over buddha bowls, chopped salads, spread in sandwiches and wraps or as a dip for veggies or fresh salad rolls. It’s quite thick as is but if I want to use it on a salad, I’ll scoop some into a small dish and mix with a bit of water to make a thinner salad dressing. It’s also quite spicy even with just 1/4 tsp red pepper flakes and it gets spicier as it sits in the fridge. If you don’t like spice I’d recommend leaving it out. For more zucchini noodle dishes, try my Easy Cheesy Vegan Zoodles, Vegetable Lentil Zucchini Noodles, Vegan Pesto Zoodles with Broccoli or Roasted Garlic and Red Pepper Zoodles. 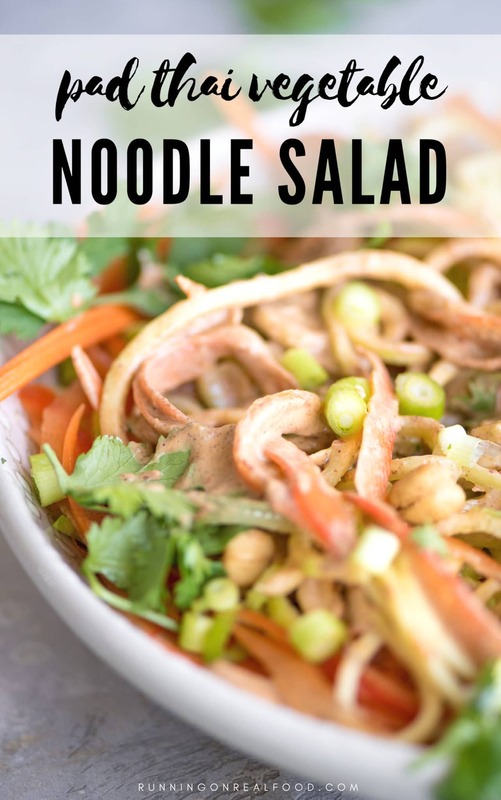 This cold vegetable noodle salad is brought to life by this most delicious, creamy almond pad thai sauce. This sauce can be used over any salad, noodles, stir-fry, rice or roasted veggies. 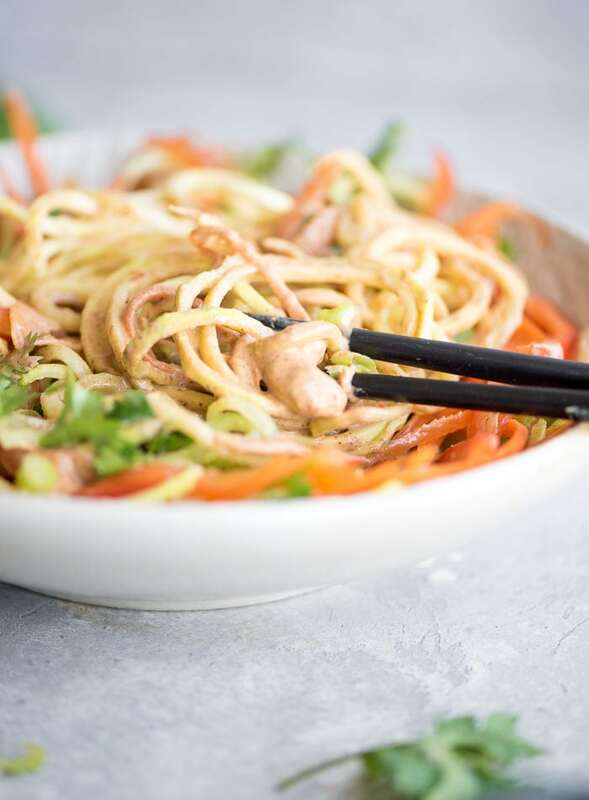 To make the almond pad thai sauce, blend all the ingredients until smooth and creamy, adjusting the amount of water as needed to reach desired consistency. With 5 tbsp it will be quite thick, and can be used as a sauce or dip, add a bit more for a slightly thinner sauce that’s closer to a dressing. Note: it will thicken as it’s stored in the fridge and you can always add water later to thin as needed. To make the vegetable noodle salad, add all of the ingredients to a bowl and top with desired amount of pad Thai sauce. The salad ingredients listed are for one person. Increase as needed depending on how many servings you want. The sauce makes 4-6 servings or more depending on how much you use. You can use raw almonds as a replacement for almond butter. I don’t have an exact amount but I’d try 1/3 cup to start, you may need more or less water. The sauce is quite spicy with just 1/4 tsp of red pepper flakes and it gets spicier once stored in the fridge. I wouldn’t recommend adding more. You can omit it if you don’t want it to be spicy. The noodle salad gets wattery once stored so I would recommend only making it as needed or storing it separately from the sauce if making a larger batch. The sauce keeps well in the fridge up to 5 days so you can use it on a variety of dishes throughout the week. Easy stir fry sauce, and a way to use the tamarind paste I had bought months ago in error! My bloke couldn’t stop smiling and I was so pleased that I resisted the urge to buy a ready made stir fry sauce. In fact, this isn’t just a stir fry sauce, it can be used in soooo many ways! Thank you Derin 😁. Sooo happy you liked it! I agree, it’s super versatile! Glad you found a way to use up that tamarind paste. Thanks for the comment.